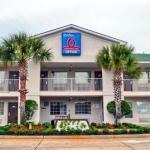 This extended stay Pascagoula Mississippi hotel is off Highway 90. This pet-friendly hotel offers guests laundry facilities and all rooms are equipped with a microwave and refrigerator. The rooms at the Studio 6 Pascagoula hotel features wired internet and Wi-Fi. Guests can also watch cable TV in their rooms. The Pascagoula Studio 6 is within a 5-minute drive to the Jackson County Fairground. Isle Casino Hotel Biloxi is 22 miles from the hotel.